It was do or die for Toto on the group’s fourth album, and they rose to the challenge. Largely dispensing with the anonymous studio rock that had characterized their first three releases, the band worked harder on its melodies, made sure its simple lyrics treated romantic subjects, augmented Bobby Kimball’s vocals by having other group members sing, brought in ringers like Timothy B. Schmit, and slowed down the tempo to what came to be known as “power ballad” pace. 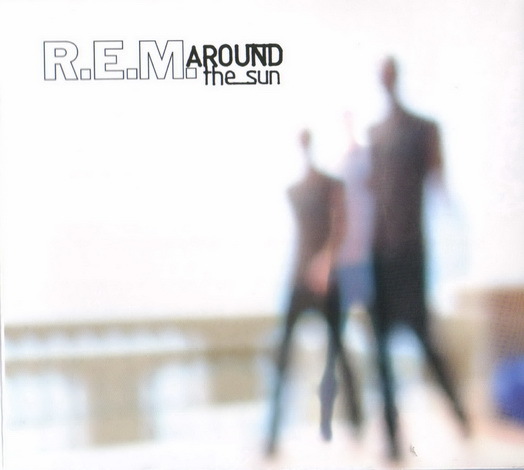 Most of all, they wrote some hit songs: “Rosanna,” the old story of a lovelorn lyric matched to a bouncy beat, was the gold, Top Ten comeback single accompanying the album release; “Make Believe” made the Top 30; and then, surprisingly, “Africa” hit number one ten months after the album’s release. The members of Toto may have more relatives who are NARAS voters than any other group, but that still doesn’t explain the sweep they achieved at the Grammys, winning six, including Album of the Year and Record of the Year (for “Rosanna”). Predictably, rock critics howled, but the Grammys helped set up the fourth single, “I Won’t Hold You Back,” another soft rock smash and Top Ten hit. 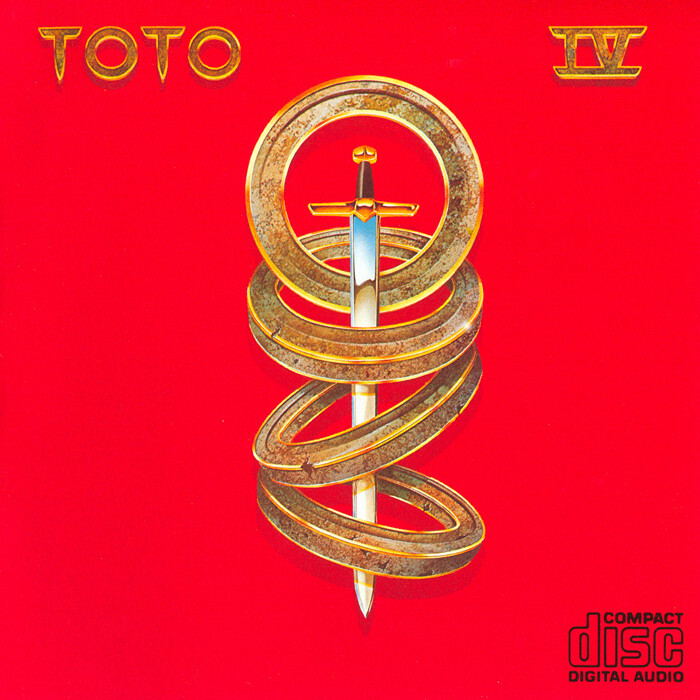 As a result, Toto IV was both the group’s comeback and its peak; it remains a definitive album of slick L.A. pop for the early ’80s and Toto’s best and most consistent record. Having made it, the members happily went back to sessions, where they helped write and record Michael Jackson’s Thriller. If Toto’s musical advantage was that, since its members continued to play on many of the successful records made in L.A., its own music was popular almost by definition, its disadvantage was that it made little attempt to seek an individual musical signature — a particular style, say, or a distinctive singer (Bobby Kimball was not it) who could make its records immediately identifiable. “Hold the Line” had been a big hit, but who did it? Boston? Foreigner? 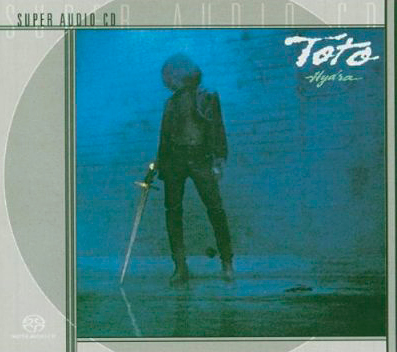 As a result, Toto was less well positioned than most to come off a big debut album with the follow-up, and Hydra was unusually dependent on its leadoff single, “99.” Maybe it was a tribute to the female lead on the old Get Smart TV show, but many listeners didn’t get a song with a chorus that went, “Oh, 99, I love you,” and the single stalled in the bottom half of the Top 40. The album went gold on momentum, but the songs, however well-played, simply were not distinctive enough to consolidate the success Toto had achieved with its debut album. 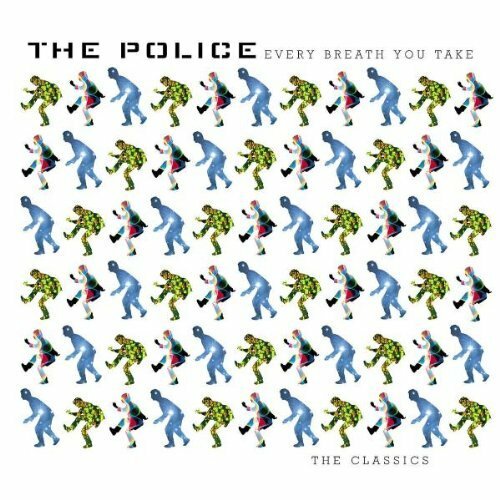 By deleting the 1986 hits collection Every Breath You Take: The Singles and replacing it nearly ten years later with Every Breath You Take: The Classics, A&M improved the original set — but only slightly. Instead of finally adding the missing hits that were mysteriously absent the first time around (“Synchronicity II,” “Demolition Man,” “So Lonely,” etc. 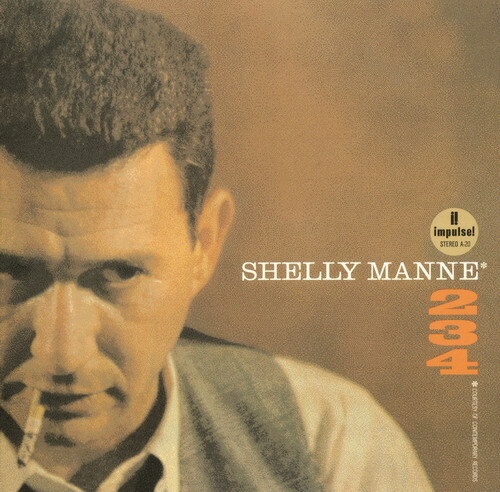 ), there are only two additional tracks — the original version of “Don’t Stand So Close to Me” and a “New Classic Rock Mix” of “Message in a Bottle.” Again, the included hits speak for themselves — “Roxanne,” “Walking on the Moon,” “Every Little Thing She Does Is Magic,” “Wrapped Around Your Finger,” — but ultimately, The Classics misses the mark. Why would a Police fan who already owns The Singles want to replace it with a modestly different repackaging? A&M should have added some of the missing classics instead of just rehashing what many fans already own. 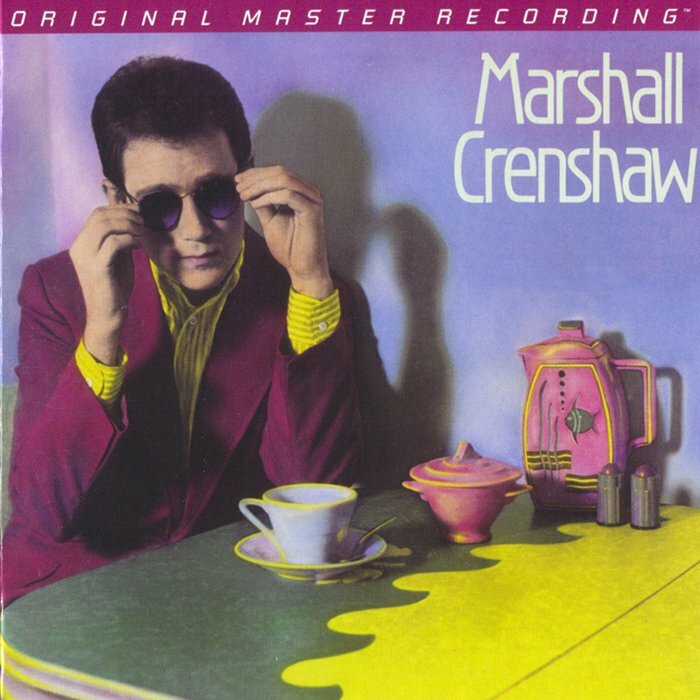 Marshall Howard Crenshaw is an American singer, songwriter and guitarist best known for his song “Someday, Someway”, a top-40 hit in 1982. The latest in MDG’s fine series of live recordings by Stefan Blunier and the Beethoven Orchestra of Bonn is an intelligently chosen programme of three of Respighi’s orchestral works that illustrate the many and varied aspects of this master orchestrator’s compositions as well as his homage to music of the past. It is also pleasing to see two of the works making their first appearance on SACD. The delicate ‘Trittico Botticelliano’ of 1927 was conceived while the composer and his wife were touring the United States and is representative of his interest in, and study of, the Renaissance and Baroque music of his native country. Respighi chose to depict both the atmosphere and spirit of three of the most celebrated of Botticelli’s paintings, ‘Spring (La Primavera)’, ‘The Adoration of the Magi’ and ‘The Birth of Venus’ using small orchestral forces. Each of these three tiny tone poems is exquisitely scored, and thanks to Blunier’s relaxed tempi, the players of his cultivated Bonn orchestra have time to relish each of the individual solo opportunities provided. The sound is both diaphanous and crystal clear. 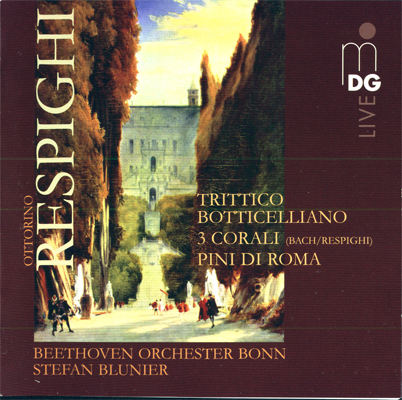 Like many 20th century composers Respighi made arrangements of the music of earlier masters, and the ‘Tre Corali’ is one such example. His arrangement for orchestra of three of Bach’s most well-known organ chorales may be anachronistic, but few could fail to marvel at Respighi’s imaginative scoring and respectful treatment of them. The three chorales are ‘Nun komm der Heiden Heiland’, ‘Meine Seele erhebt den Herren’ and ‘Wachet auf, ruft uns die Stimme’. The manner in which the luxurious and glowing string sound has been captured on this recording is particularly arresting. The final work on this SACD is the much-recorded ‘Pini di Roma’, the second part of the so-called ‘Roman Trilogy’ and a piece beloved of many audiophiles. Blunier is not a conductor who rushes his fences and his tempi in all but the first section of the work are slightly more measured than is often the case, but are nevertheless quite convincing. The first part of ‘The Pines near a Catacomb’ is wonderfully atmospheric as is the balancing of the distant trumpet and nightingale song in the section that follows. Unfortunately the total absence of deep organ pedal notes at any point comes as a major disappointment. Blunier’s steady pace does pay dividends as the army of the Consul traverses the Appian Way accompanied, on this recording, by exceptionally thunderous drums. 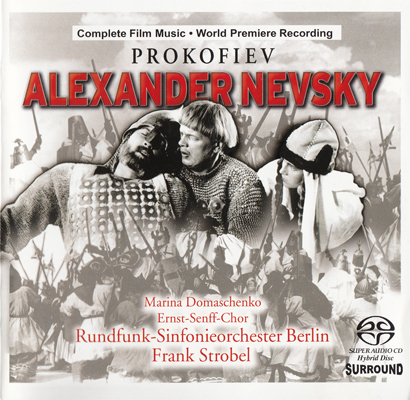 It is, however, a pity that the use of the surround channels for the extra brass is a mite cautious and consequently the work’s final bars fail to make the impact found on the recent thrilling Neschling recording Respighi: Roman Trilogy – Neschling. An enjoyable performance then, but not a first choice for this work in an increasingly crowded field. MDG’s 5.1 recording is of high quality, possessing a wide dynamic range, an excellent sense of depth and tonal veracity, but it is important to stress that this disc does need to be played at a high volume setting or the sound can seem somewhat lacking in presence. Though these are live recordings, extraneous noise is minimal and there is no applause. This might be a single disc, but it is really two different recordings, in two different halls, at two different times, of two distinct musical forms. In the above, WoO numbers refer to the German acronym WoO (Werk ohne Opuszahl) meaning a ‘work without an opus number’ as given in the Kinsky-Halm catalogue. Hess numbers refer to additional works listed in the catalogue by Willy Hess that are not in the Kinsky-Halm catalogue. 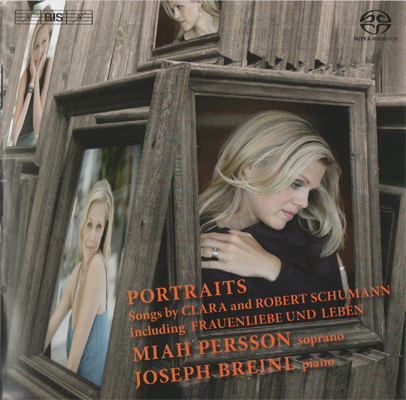 The Sony SACD piano sound has a lovely zingy bass, and yet a softer ‘distant’ quality. 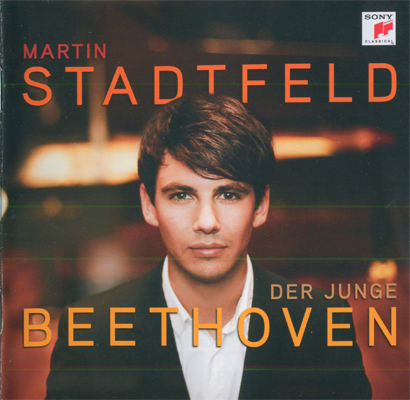 Stadtfeld has a light delicate touch where appropriate, and equally some uber sturm und drang when needed, as in the absolutely magnificent Prelude in F minor WoO 51. There is, however, some slight unevenness in Stadtfeld’s ornamentation in the Rondo, which suggests that slower tempi might be appropriate. Indeed, I think his Rondo No.1 is too rushed by any measure, to the extent that musical virtue is lost. In this regard, I distinctly prefer the version with the American pianist Russell Sherman on Redbook CD (6min10sec vs 4min53sec for Stadtfeld). The Allegretto, the fabulous Prelude and the Adagio are all splendid. On balance, the solo repertoire is a very fine recording of unusual early Beethoven repertoire, and comes highly recommended. … My inclination: enjoy the disc the way it should have been correctly conceived … as an excellent solo album by a very talented pianist … and just ignore the rest.